Help us make history. 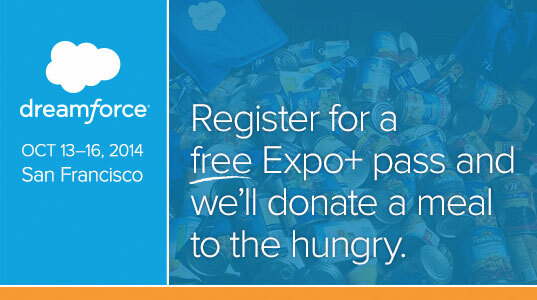 Come to Dreamforce and be a part of the world’s largest food drive. Just register for a free Expo+ Pass and we’ll donate a meal on your behalf to someone in need. The goal is to hit 1 million meals and we can do it with your help. There’s no better time to give back. We thank you for your support and look forward to seeing you soon at what promises to be an unforgettable Dreamforce.